The 12V melody maker can be used alongwith the pair horn to create 7 types of sounds. Can be used in cars as well as motorcycles. Melody maker 3 way for twin tone horn/ musical jumbo horn/ meta twin tone horn. Best Qualitymanufacturer of Melody. Also available in 24V.Heavy Duty products are available. Our customers can avail a wide array of technically modern Melody Maker. 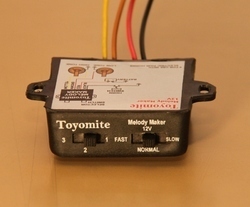 Melody makers being provided by us are quality examined to meet global standards. These products are applauded for their high quality, reliability, durability and workability.